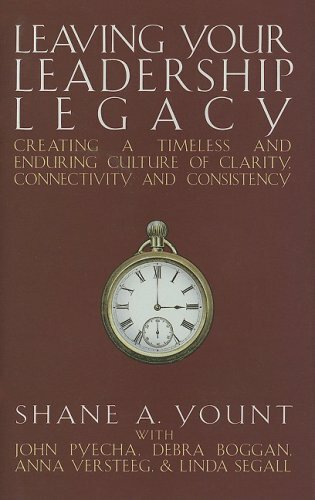 Timeless or Temporary - What will your leadership legacy be? All too soon the day will come when you will leave your current leadership position - be it to move up, to move on, or even one day, to retire. Have you given any thought to what your leadership legacy will be? Will the organization you leave behind be able to prosper without you? Have you created a culture where visible and auditable systems drive clarity, connectivity, and consistency throughout the organization? Have your behaviors inspired others to grow, to develop, and to excel into the next generation of leaders? Have you elevated expectations of engagement, creating a culture of collective accountability? Or, have you fallen into the trap thousands of leaders today have fallen into - achieving performance through proximity, persuasion and position? This, in essence, is managing by personality and is demonstrated by a key factor required for achieving performance - you. For things to happen right, you have to be there. Your physical presence is required. Are you such a leader? A leader who has mastered selective engagement? A leader who has learned to be extremely persuasive in order to convince individuals to be engaged? A leader whose presence gives workers confidence, but whose absence causes the team's confidence to diminish? This book makes clear the qualities and, perhaps more important, the systems required for leaders at all levels to leave a leadership legacy. Cultivate these qualities as you put into place the sustainable performance systems explained herein and you will leave a legacy you can be proud of.